Five tech tools -- innumerable possibilities. I think our teachers and students will absolutely love these tech tools! 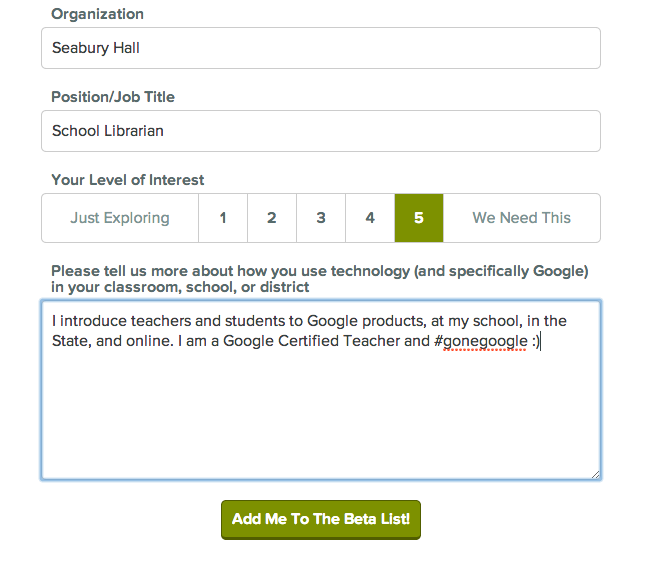 I learned about them at the Hawaii #gafesummit, which was a delightfully surprising experience. Have you had any experience with these tools? I learned about this very promising now-in-private-beta tool from +Chris Bell's demo slam. PearDeck is "an interactive presentation system for active classrooms". It's made especially for 1:1 Chromebook classrooms. It's a start-up by 3 Iowa City teachers whose web-based gradebook ActiveGrade, LLC, was acquired by Haiku Learning. A talented trio indeed! According to the web site, "Pear Deck makes it easy to plan and build interactive lessons directly from your Google Drive that promote active learning in the classroom. As students interact with the lesson, real-time data provides instructors the feedback they need to adapt teaching on-the-fly." This video gives a nice overview of the product. Here's a review: ActiveGrade founders create new education startup Pear Deck, Silicon Prairie News, March 3, 2014. I hope to hear from PearDeck soon! You can explore the gorgeous photospheres in Google Maps | Views and also join the Google Maps View G+ community. The official hashtag throughout the social networks is #photosphere. Check out this 360º photo of Kula, Maui, by Ed White. So peaceful. Photo Sphere would be perfect for any place-based student project, as would Tour Builder and Google Map Engine. Tour Builder, also in Google Maps, is a browser-based tool to 'put your story on the map'. This would be an engaging way for our students to document and share their Maui field trips, as +Pete Hansen and his seventh graders have done with Waihe'e Ridge Hike. Great photos! Tour Builder looks simple to use and is recommended by Google Lit Trips founder Jerome Burg. I was blown away by +Molly Schroeder's "Pack Your Bags" Demo Slam. She had asked participants to fill out a Google Form describing their favorite vacation spot. Molly compiled the data into a map, using Google Maps Engine. Impressive! Molly describes the process of importing data into Google Maps Engine, in this tutorial. Google Maps Engine is a fantastic tool for making all kinds of crowdsourcing comparisons, across the curriculum and across the globe. So powerful! Eye-Fi for Android is an SD card for instantaneous wireless transfer of photos. The card creates its own WiFi signal! I first heard about Eye-Fi via +Veronica Partida's tweet during the Summit. Eye-Fi would be fantastic for our students' photo projects, again, across the curriculum. What a timesaver! Yes, 5 tech tools, innumerable possibilities.